Researchers led by Carnegie Mellon University’s Molecular and Biosensor Imaging Center (MBIC) Director Marcel Bruchez have re-engineered a fluorescent probe into a powerful optogenetic photosensitizer that can be used to manipulate cells. Optogenetics refers to a process in which light is used to control a biological function. Researchers do this by programming light-activated components into an organism’s genetic code. When those components are exposed to light, they cause parts of the organism to function differently. To create their optogenetic tag, the researchers engineered a dye that would not only glow but also produce singlet oxygen — a toxic form of oxygen — when it bound to a FAP and was exposed to light. This FAP-Targeted and Activated PhotoSensitizer approach (FAP-TAPS) not only allows researchers to visualize the protein they are targeting, but also can be used to selectively inactivate the protein. Previous attempts at developing such photosensitizers have been limited by their inability to selectively bind to target proteins and their need for high doses of light at biologically damaging wavelengths. The FAP-TAPS complex overcomes these obstacles with the precise targeting features of FAPs and the use of light in the far-red or near-infrared spectrums. Light at these wavelengths is both tissue penetrating and biologically safe. The FAP-TAPS approach also requires significantly less light than other photosensitizers, like Killer Red. In addition, singlet oxygen is biologically reactive over a short range, so it doesn’t harm proteins in other areas of the cell, or cells in other areas of the organism. In the paper, the researchers proved the effectiveness of the FAP-TAPS module in a population of zebrafish. They first created a fish that expressed the FAP module only in cardiac muscle cells. They then added the dye and exposed the fish to light. In larval fish, the effects were immediate — the heart stopped beating and the blood flow ceased. In adult fish, the fish displayed a cardio-toxic response, and began to transform cardiomyocytes into proliferating cells, which repaired the damage within days. 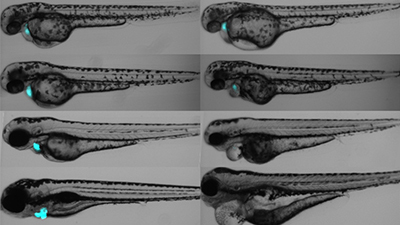 In addition to the proof-of-concept, the results show that FAP-TAPS could be used to study cardiac regeneration in zebrafish. Additional authors on the study include Carnegie Mellon’s Jianjun He, Yi Want and Lydia A. Perkins; and the University of Pittsburgh’s Maria A. Missinato, Ezenwa Onuoha, Simon C. Watkins, Cladette M. St. Croix and Michael Tsang. A video describing the technology is available.